SocialAdr Third Party Review – We Don’t Guess, We TEST! SocialAdr Social Sharing and Bookmarking have been around for a long time, but everyone that we have seen report on it has just guessed if social sharing/bookmarking works or not. It depends on whom you listen to in the SEO Industry. Whomever it is, they seem to back it up with logical data that makes us believe their theory is correct, but the bottom line, it is always JUST THEORY. 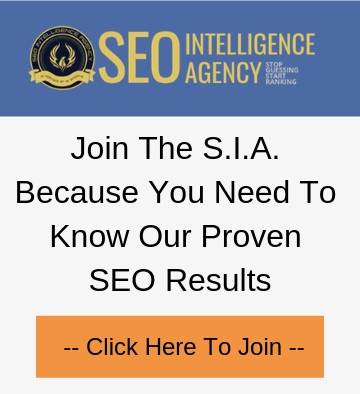 The SEO Intelligence Agency is comprised of a small group of SEO Professionals dedicated to testing & reporting SEO metrics by creating singular tests that allow them to identify ranking variables. SocialAdr Social Sharing and Bookmarking Tool Receives Huge Thumbs Up. Ben Roy (of SocialAdr): Dori Friend has been in the SEO space for a long time and is pretty well known. She is one of the founding members of the SEO Intelligence Agency. But Kyle Roof is a little bit under the radar in our industry. A little bit of a secret presence. He is an expert in all things SEO especially when it comes to data driven analysis. Kyle Roof (from the S.I.A. ): Before we start off, let me tell you a story about Isaac Newton. 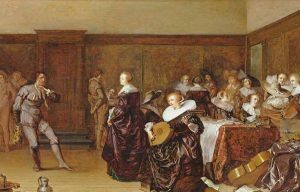 You might know him for his big hits – gravity, laws of motion, calculus – but before he was doing all that, he was hitting the British aristocracy party scene in the 1660s. This sort of parties were for the genteel folks, a venue for the opposite sexes to mingle and meet and greet. Isaac dominated the parties when he goes to them and monopolize the time with the ladies. He would be science, science, science, it is the most important thing in the world, etc. He would go on to say that science can measure anything and quantify anything. That is an important point because if you can quantify something then you can qualify it, which means that you can study it. He goes on and on about how great science is because of that. In one particular party, there was this baron who had enough of it. 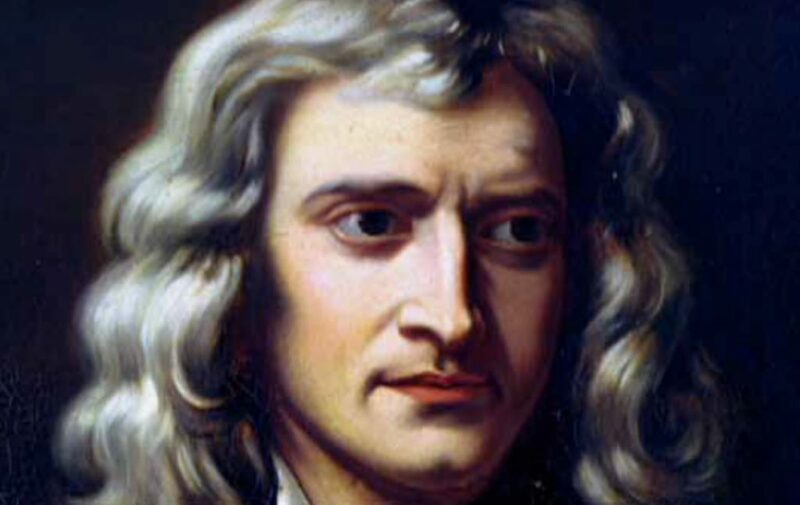 He walks up and goes “Newton, I’m tired of you, I am tired of your science, science can’t do everything that you say it can, science can’t measure everything.” Newton was “Yes, it can”, “No it can’t, “Yes it can’t”, “Prove it”. So they placed a bet. We are not exactly sure what the bet is for but clearly, it is not a good thing because people were going up to Isaac and telling him that he can back out of it, it’s a party, etc. He says not to worry and that he got it cause he has the scientific method. So the terms of this was, the baron will go to his buddies and talk about something that can’t be measured and Newton has 30 days or until the next party to prove that it can be measured. 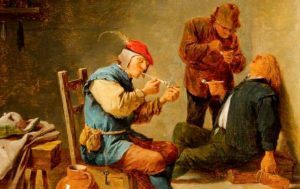 The Baron goes to his buddies and comes back and takes a long drag on his cigarette and says..
“Science can’t weigh the weight of smoke” Newton says’ “I’m on it” and leaves the party. Fast forward to a month and nobody has seen Newton the entire time. We get to the party and he’s not there. The baron was there and was laughing it up and everybody was getting nervous. Nobody has seen Isaac for a while. Towards the end, he still wasn’t there and it wasn’t looking good. Suddenly there was a sound at the back of the party and in comes Newton pushing a cart with a tart on top of it. People were “Oh my God, did this guy just invent a smoke weighing machine?”. He pushes the cart in the middle of the room and everybody gathers around. With a flourish, he pulls off the tarp and there was a scale. At this point, the baron was losing it. Newton then reaches into his jacket pocket and pulls out a cigar. Newton puts the cigar on the scale and says “Ok, we can all agree that the cigar weighs 10ounces”. So he lights the cigar and goes all the way down to the ash, re-measures that ash and says “We can all agree that this ash weighs three ounces. 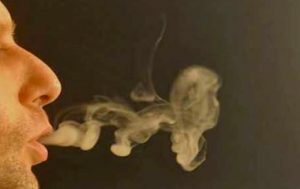 The weight of smoke is 7 ounces.” The Mic dropped and he said “ladies this party bores me let’s go” and takes all of the ladies out of the party with him. The moral of the story, aside from the fact that Newton can take your ladies, everything is measurable if you think of it the right way. Even Google Can Be Measured. And that is an important idea when you are thinking about the algorithm or you are thinking about what is going on, when we are thinking about what we are trying to do is SEO, it is important to understand that this can be measured, we just have to think of it the right way. The difference between an SEO enthusiast and an SEO Pro is that the enthusiast will just tell you something they have read in MOZ or some other blog. The Pro is going to tell you something that they just tested. Usually what you run across are case studies and/or correlations studies. Case studies is where you read something where somebody says “ok I am going to do this” and then they go and do it and share their results. It is a good thing but usually it doesn’t qualify as a scientific test and the reason is that there are too many variables going on. They are testing within the algorithm which has a lot of other factors that come to play, like a lot of other websites, for example. It is difficult to reproduce what they have done because they are in a particular niche and there are a lot of other variables going on. One that you see more often than not is a correlation study. Correlation studies are often very good but the problem with these things is that they often do not tell you exactly what is going on, what is working or not. They just tell you a consensus of what is seen or not seen. As an example, Stone Temple consulting agree with the idea that correlations aren’t maybe showing you the full picture. What is interesting about this is that the code is, the mean of individual correlations approach, is not providing a complete picture. Part of the problem with correlation studies is that, then readers take it as fact especially when it comes from industry leaders. The problem is when you do SEO for a few years, you start to see that a lot of these are kind of a rehash or mashup of last year’s mediocre advice. For example when you see a correlation study often they will say that they are positive correlation that we see and many websites have this sort of a factor but then you will see a negative zone. More ranking sites do not have these things and you think that would represent something that is bad to do or you shouldn’t be doing. There is this Moz Correlation study. In the left, it shows certain factors and then it gives you a positive and negative correlation, positive to the right, negative to the left. What is important though is these two – Open graph and schema. 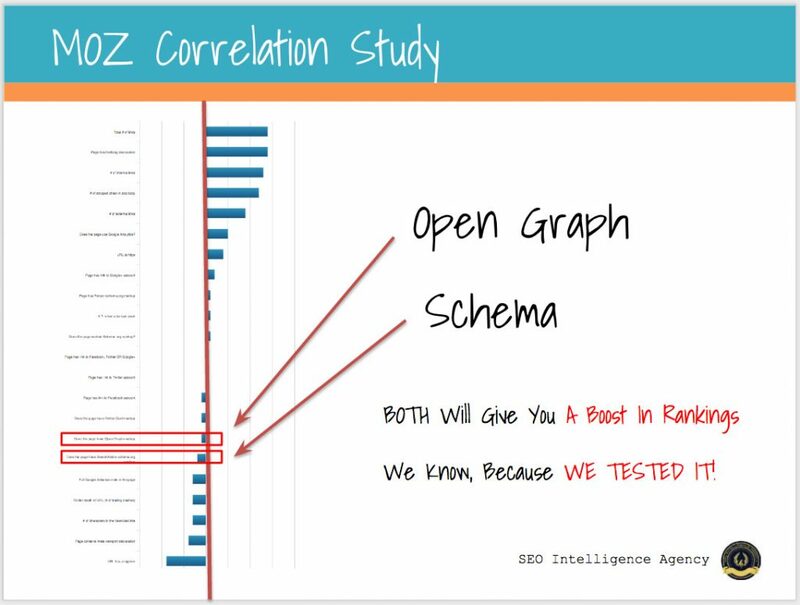 They are saying there is a negative correlation between sites that have open graph and schema that are ranking for particular keywords. The thing is, in SIA, we actually tested open graph and schema and we know that both gives you a boost in ranking. We know that because we tested it! The issue with that is that open graph and schema are advanced and are not easy to understand and implement. They are not in a lot of ranking sites but that does not mean they are not a ranking factor. But as a result, because there might be difficult aspects in implementation, what shows up in MOZ looks like a negative factor rather than this is actually a ranking thing, just that not a lot of people are using it. 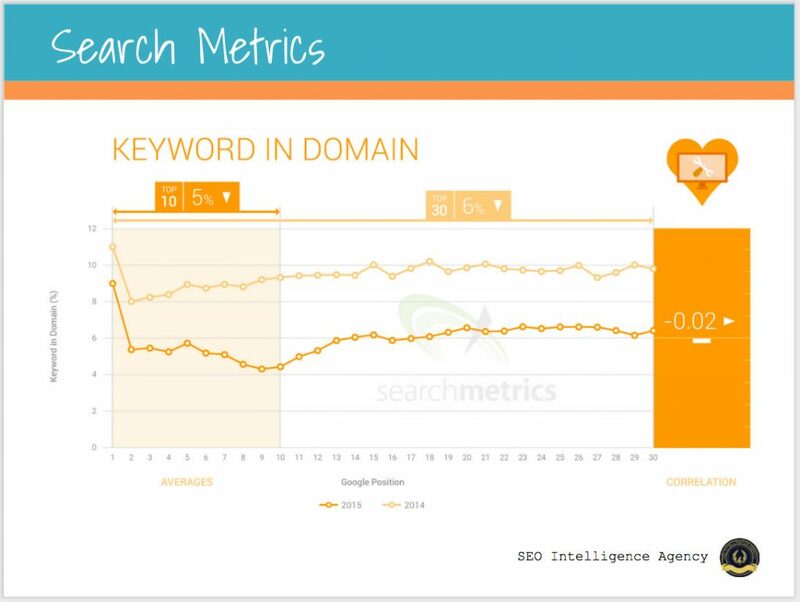 Another thing is keywords in the domain and this comes from Search Metrics. What they are saying is that the sites that are winning in particular target keywords, you see less and less exact or partial match domains. Those are domains that contain the keyword in front of the .com. 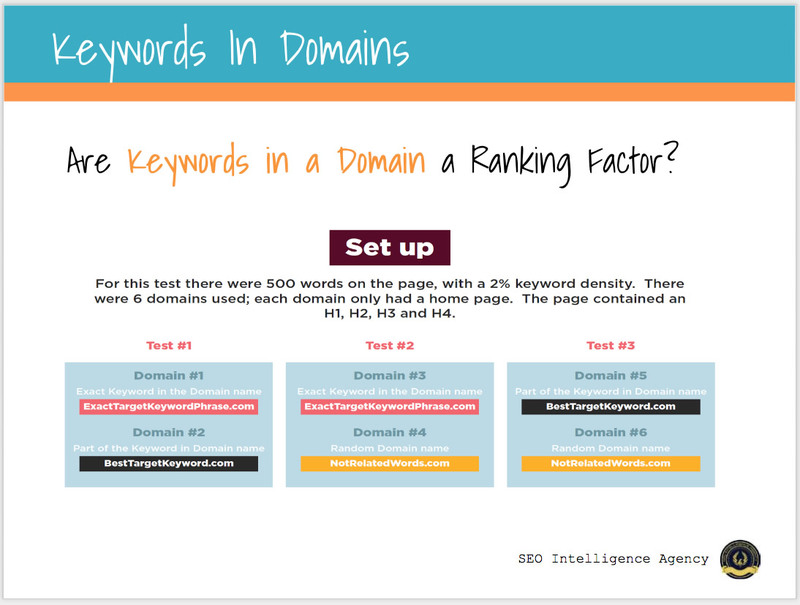 They are saying that that is going down in the top 10 sites for particular keywords. The thing is, the real reason that there might be a drop in the usage is that, industry leaders are saying that they do not work anymore. People are not focusing on that and not doing that and they say domains and search results have decreased continuously in recent years and then at the bottom they say it comes from MOZ and they even say their own guide on SEO 101 when choosing domain names, don’t focus on keywords. To back that up, they point to their own correlation study. What you end up is kind of a cycle of correlation studies. They give us advice to follow, and then the Google results that when you see something like don’t do exact or partial match keyword domains, people do them less as a result of all the advice, you see them less in results. So that when you do next years correlation study, it will show that there has been a drop in that particular factor. What perpetuates it even more is that a lot of these studies ask experts that supply the information in the first place, “what do you think?” Then the experts and their opinion says “I think it’s this and I think it’s that” and they often cite correlation studies. You end up with a self fulfilling prophecy of cycles. And, you end up getting wrong information. Information that is unreliable. As a result of moz and search metrics having tons of followers, they perpetuate that cycle, and you have hundreds and thousands of people implementing things that look like potential negative factors, it returns mediocre SEO. It is the dumbing down of SEO. But actually that is good for us because the idea is that please follow correlation studies, I’d rather test something and know for sure. 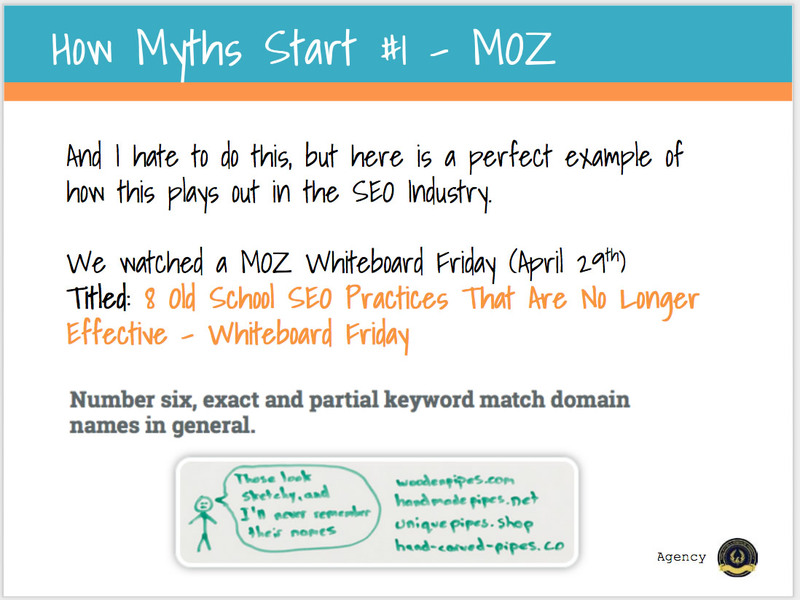 This comes from whiteboard Friday and MOZ from April 29. 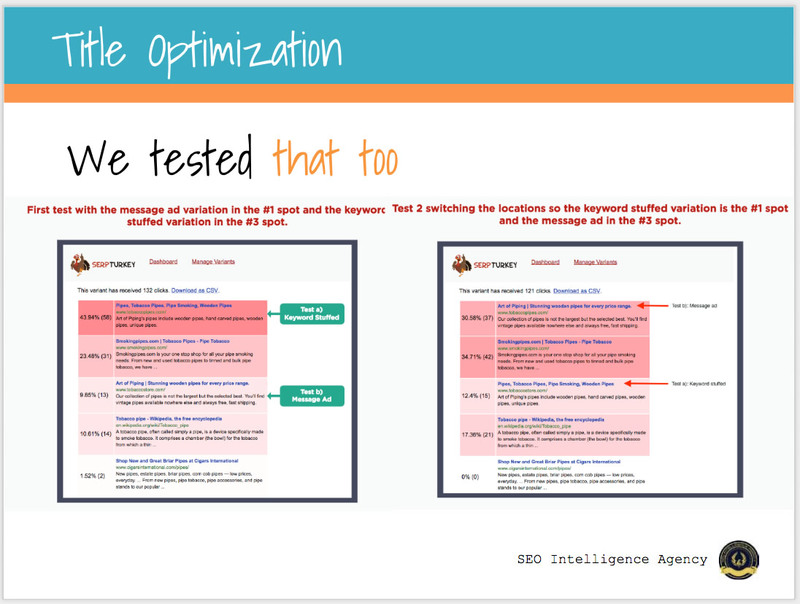 The title is “8 Old School SEO Practices that are No Longer Effective. Number six was exact and partial match domain names do not work anymore. It’s a myth. It used to work but they don’t any longer. And then again if you look over ahrefs, they too did a “case study” on the term “content upgrades” and they have content upgrades pro where content upgrades was an exact match domain. 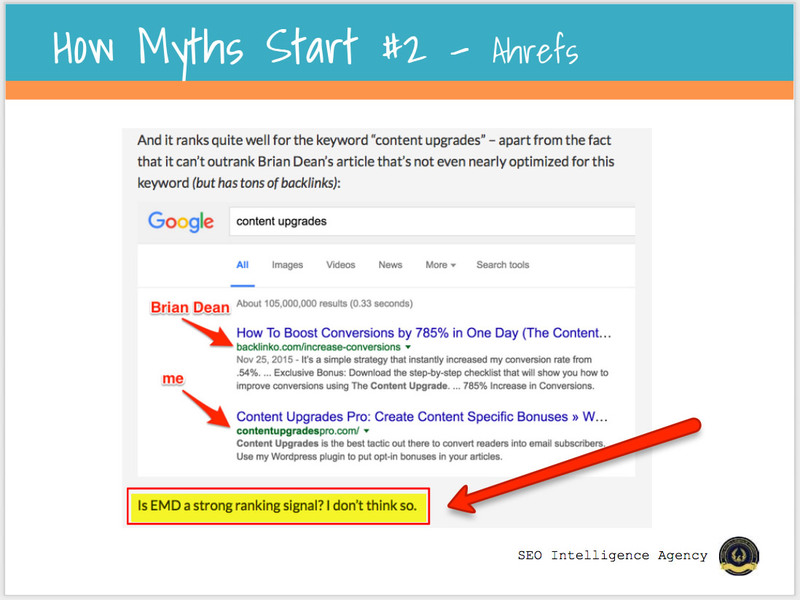 They point out while it was ranking well, it didn’t beat one particular site and so they come to the conclusion that “Is EMD a strong ranking signal? I don’t think so”. One step back is, why would they be saying this? Because ahrefs are selling analytics on links so they are making the argument for the power of links and the thing is of course links are strong and of course they are a ranking factor, but to say that those other things are not significant for Google rankings is just flat wrong. Those are things that we know because we tested those things and we know that they are a ranking factor. 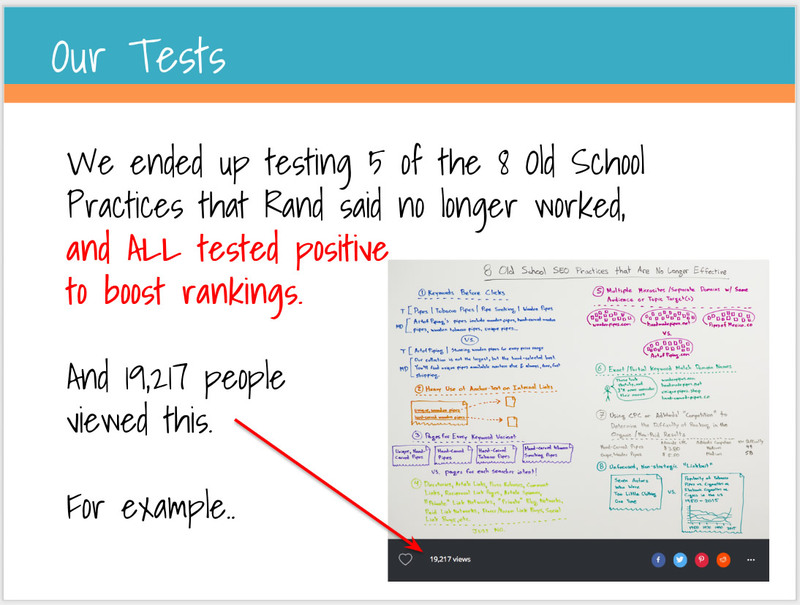 Now, showing you how we test and how it is done, we will go back to the MOZ article about the 8 old school things..
We actually tested 5 of them that “don’t work” and they all were positive ranking factors. In the keywords in the domain, we had an exact match domain and we pitted it against a partial match, an exact match against a not related kind of domain, an exact match and partial match again a random. In the results, the exact match beats the partial match, the exact match beats the random, and partial match beats the random as well. Having the keyword in the URL is a ranking factor. This was an interesting one on title optimization. What they were saying here is that a keyword stuffed metatitle will lose to a metatitle that was written for the click as clickbait. Kind of an adwords sort of line rather than just kind of listing out your keywords. 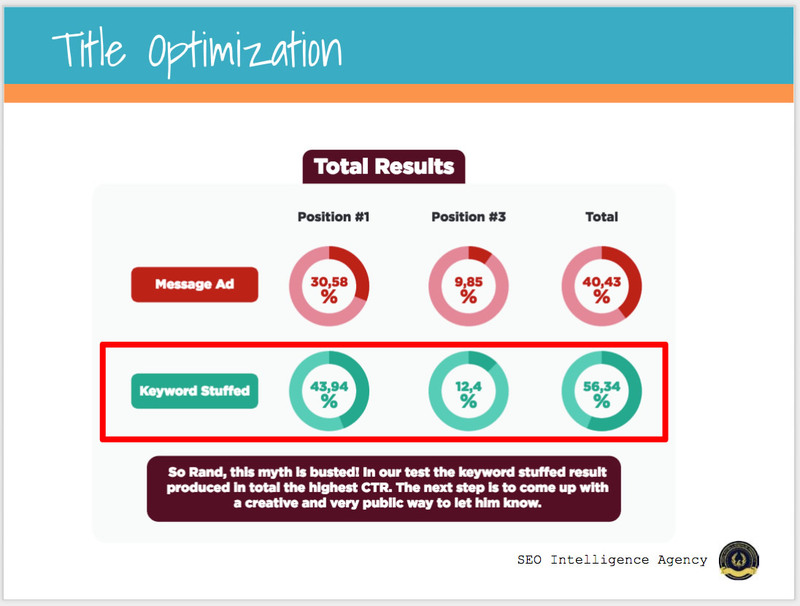 We tested this and we know that metatitle is the number one on page factor for your on page SEO. 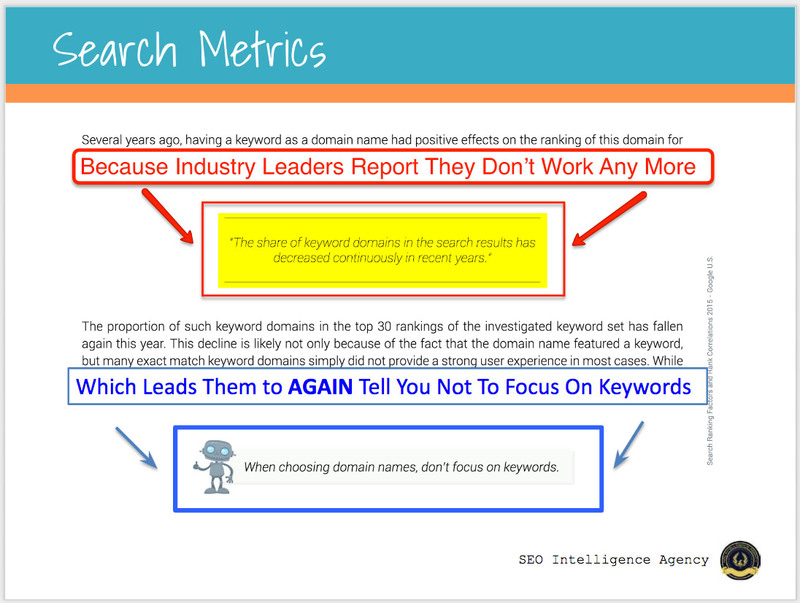 So it is really interesting when someone says don’t put keywords and don’t focus on it because that is the number one place to put it. 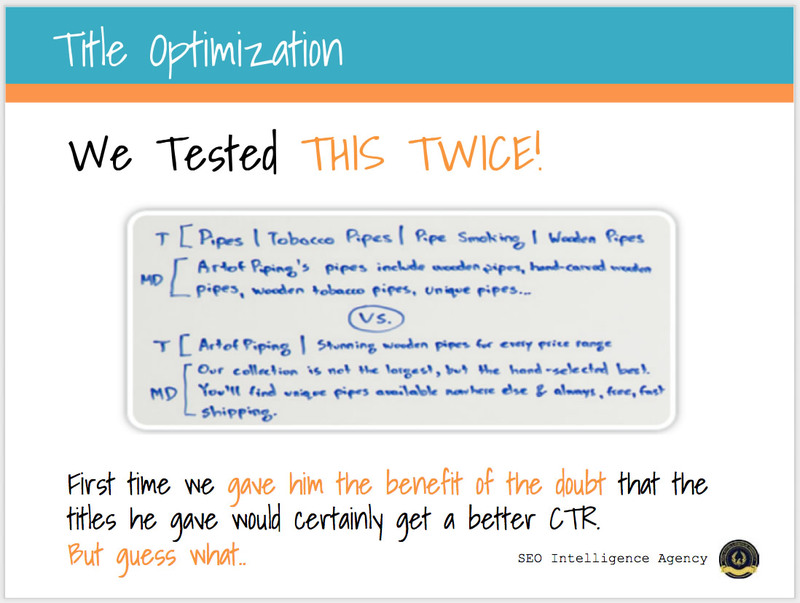 We tested it once and the keyword stuffed outrank a artfully or message written title but then it was ok, the point of the article was that clickthrough rates would be higher so then we tested clickthrough rates and we used a really cool tool called SERP Turkey where you could test organic metatitles and descriptions in an environment with microworkers and what was hilarious was that the keyword stuffed metatitles had a higher clickthrough rate than the ones that were artfully written and we even used the exact ones that were used in the whiteboard Friday. We didn’t doctor them. What that means is that, the advice that you are getting in that is don’t do this because it is not really a factor but you should do it this way because you are going to get a better clickthrough rate and that is a better factor but that wasn’t even tested. Obviously because the keyword stuffed ones on our test got a higher clickthrough rate. It was a double loss, following that MOZ advice. What we drive at is single variable testing. We try to isolate things down to testing one thing. The reasons is that we basically get a “Yes, something is a ranking factor”, “No, it isn’t”, sometimes a “No, it is a negative factor”. It is science but it is not rocket science. It is not anything that is super heady but it is controlled. How do we test single variables? We will take you back to Grade 6 real quick. That is the scientific method. For a hypothesis – why is that doing that, why is that happening, how does that work? Develop a control and test group – The control group is the group that nothing is being done to and the test group is where you do something to it and compare the two. If you have a test that is just two pages, the control group is the one where nothing is being done to and the test page is where you are going to introduce one factor. Eliminate variables – variables are things that can change. You want to be able to eliminate things down to one variable that you can test. Then you’ll know if it’s a factor or now. If the experiment page responds, you’ll know what you have. You eliminate variables basically by doing the same between your pages except for that one thing that you are experimenting on. That way, you know that that one item, the one that differs between those two is a factor or now. Keep accurate records – Probably the hardest thing to do but it is important to know what is going on and when you do things, etc. to keep your tests valid. So how do you do this in SEO? 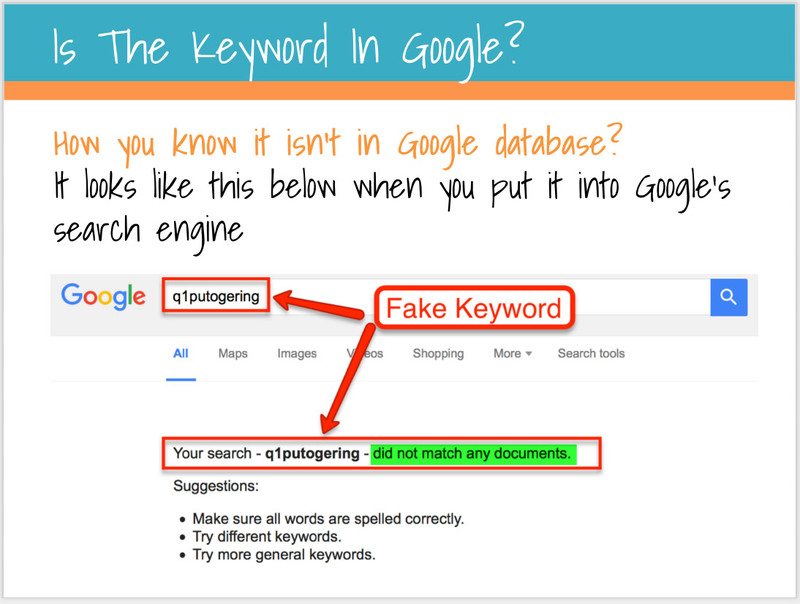 Trick: add a “k” or a “q” or “j” or something to the keyword to get a “unique” keyword.How do you know that it isn’t in Google’s database? It is when you search for it in Google and it shows that it did not match any documents. Note: You might have 9 ideas, that’s 9 tests. We don’t want to put things together. We’re trying to get down to one variable to see what’s actually happening. Wait for the pages to index – You can use an indexer. If you do the exact same thing to both pages, you’ve eliminated a variable. So you can fo the same thing to both. 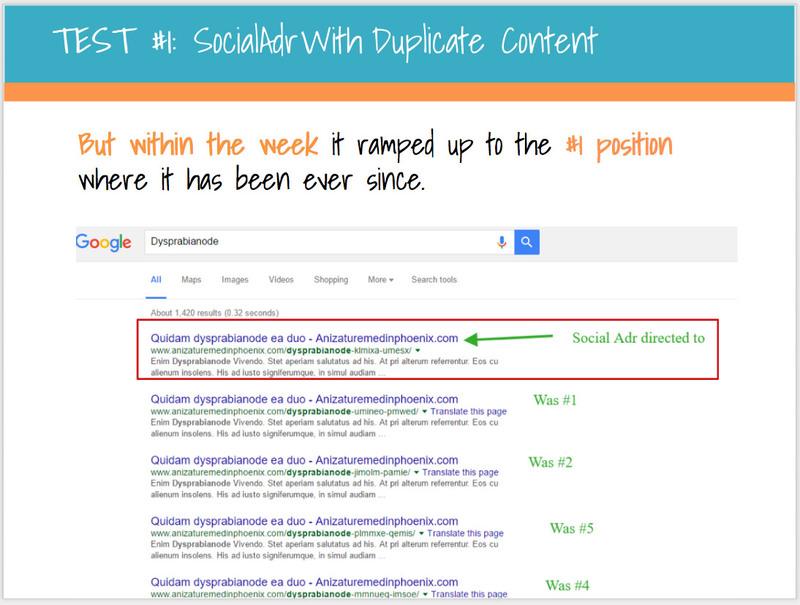 Note: There’s also no problem on duplicate content because we’re doing only one keyword. There are no documents in Google so there’s no penalty or if there is a penalty, it is equal on both pages. There point on that is, whatever you do to one, you have to do to the other unless that’s the one thing you’re testing. 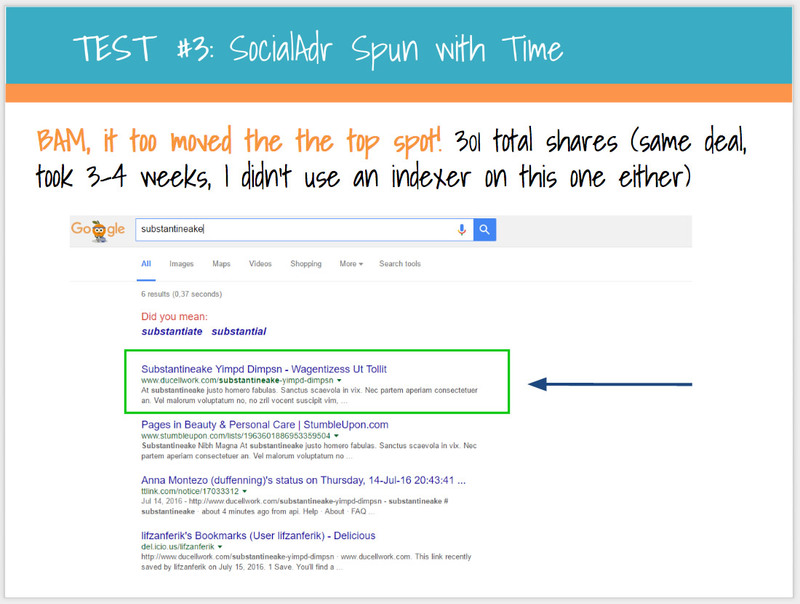 Does the Use of SocialAdr affect rankings on Google? Is it a positive thing? Does the program actually have any positive effect? As we search for previous test results, we didn’t find any, but we did get a lot of theory on the subject. Thus, we decided to put it to the test and use SocialAdr as the preferred tool to get social sharing and bookmarks. 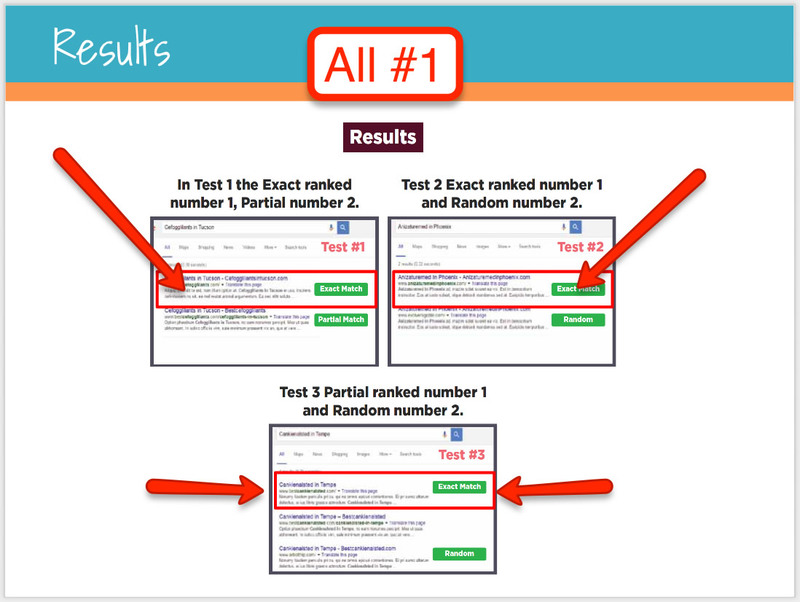 In this test, we set up 5 identical pages, we indexed them and observed their ranking order and either the 2nd or 3rd spots were chosen to receive links for SocialAdr. The reason is so we could see if there is up or down movement. That way, we can see if something is a positive or negative factor or no factor. Afrer all pages were indexed in Google, listing #2 was chosen to be the test page that would receive the SocialAdr links. Within 2 days into the campaign, the test page dropped to the #4 position indicating transitional rank – the Google dance. But within the week, it ramped up to the #1 position where it has been ever since. That was at the conclusion of the links running through the link indexer. Even though the test page initially dropped in rankings, this is not unusual when a ranking factor is introduced to the SERPs. Dropping down or out of the rankings completely is an example of transitional rank or Google dance that we often see when testing ranking variables. We consider Test 1 a Win! The description put into the SocialAdr dashboard was real English. After the spin there were some errors with the word “and” being read as html code. There errors were left in on the assumption that a novice user might just leave as is and to see if the drop we were seeing was not the dance but the duplicate content. The biggest difference between test #2 and test #1 is that this test was ran as if we were a novice. After all pages were indexed in Google, listing #3 was chosen to be the test page that would receive the SocialAdr links. After a few days of the SocialAdr Campaign, the test page disappeared from listings. There was a previously unranked page that showed up. Two days later, the test page reappeared in the #2 spot and stayed there for a bit. Then 3 weeks later, BAM, top spot! – no extra shares, it just took 3-4 weeks to take effect. Once again we saw the test page dance prior to settling into its ranking which is normal. Even without using a link indexer to send SocialAdr links to, there was still a positive movement that ultimately went #1. 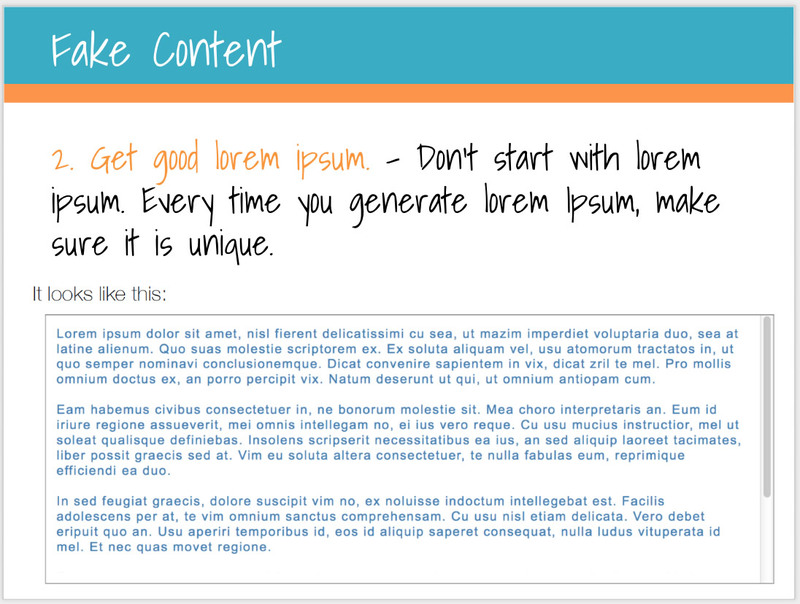 For maximum results, we advise fixing spun content errors. If you need faster results, consider using a link indexer. The test represents unique and readable descriptions along with links not being submitted to a link indexer. We wanted to look at using a good description + time. After all the pages were indexed by Google, listing #3 was chosen to be the test page that would receive the SocialAdr links. The following day, the test page jumped into the #2 spot which was opposite of what we normally see because in the other two tests, they dropped. But then, a day later, it returned to the #3 spot and has remained there for a couple of weeks. Then, BAM, it too moved to the top spot! 301 total shares – same deal, took 3-4 weeks, didn’t use and indexer on this one either. Test 3 highlights an important point, things take time. It is not uncommon to see link building take weeks to have an effect. In a live environment, it can take 10-12 weeks to take impact. 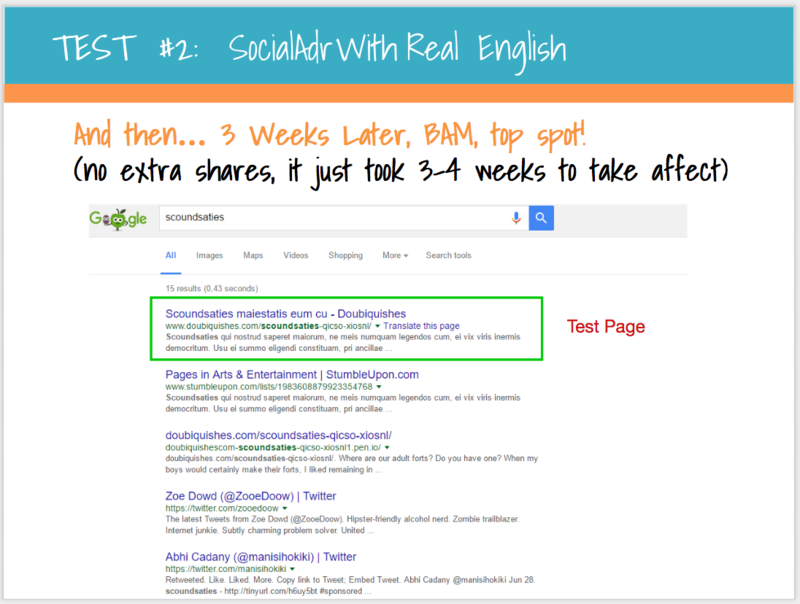 In our test environment we’re seeing 3-4 weeks for SocialAdr to affect ranking. In this test environment, there are no other factors coming in. These links are the only factors in play. That means in a live environment, it would take even longer for these links to impact your rankings. Also, transitional rank is random and Google has even said this when you read the patent on transitional rank. More often or not, we see transitional rank as a drop. 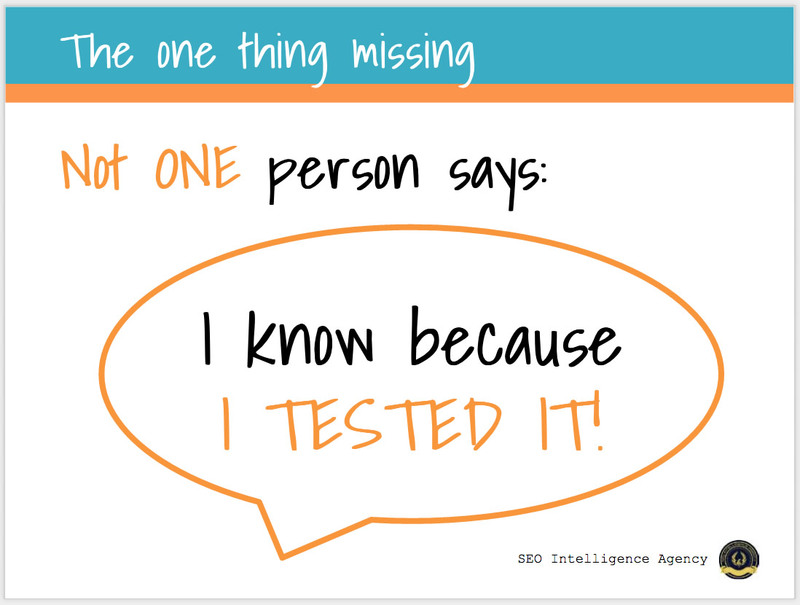 In SEO, that is usually when your heart stops. But, it is important to see that transitional rank can even go up as we saw here and it can even be nothing. When you see immediate results, sit tight, in the sense of it may or may not be the result that you are looking for because you might still be in that transitional rank. In all these things, everything has reached the number one spot and they haven’t moved and the have stayed there for weeks. We feel good about it and they are out of the transitional rank phase. In conclusion, the three tests used different variables and we feel confident saying that SocialAdr DOES produce POSITIVE RANKING SIGNALS. Get SocialAdr Now! Use at least 275 SocialAdr links – test in your niche. Keep in mind that this is a test environment and that you might need more. Q. How were the bookmarks delivered? Were they dripped or were they placed all at once? A. Yes. I put them in normal and let them go. A couple of them took almost two weeks to get up to that. The ones that went through an indexer, that was at least another week. If you will, to get all those links in. Q. When the stuff disappeared, how long was it out? A. It was gone for a day or two. That wasn’t a fun day. Q. Do you suggest putting links to inner pages or index page to both? A. For these tests, they are going to inner pages. It is the kind of thing, what would make sense. If you have an inner page that has a blog post and content that you could see being charged, that makes sense to me to do that. I always try to do things to what makes sense. Would it make sense for your homepage to blog up randomly? Maybe not. Especially if you haven’t done anything recent, no update or no new content, etc. Q. Somebody is asking here about indexing, he is saying that he has some pages that weren’t getting indexed even when running SocialAdr links set. Do you have any ideas or suggestions to check of why that happens? A. In all the ones that I have run, I ended up with 4-5 pages of Google results and they all contain the SocialAdr links and they were indexing for the target keywords simply because it was on that particular page. One way to get links indexed is to put them into a Google doc and publish it. If you ran them into an indexer, maybe the indexer didn’t do anything for you. Q. A couple of people are asking about number, is there a minimum or maximum number when this becomes a problem? A. I would say I am sure there is probably is a maximum. For these kinds of things, when I personally use things for link velocity, I think in terms of what would be natural or what would be normal. It is easy to see something blowing up for a little bit and then going off. The other point too is to think about your own niche. This was a test environment so there was nothing else there. When these links came in, these were the only factor. In your own niche, you are going after pages that probably has SEO being done to them. There are a lot of other links coming in. This will be one factor for you. This isn’t a silver bullet that it’s the only thing you have to do and you are going to rank. This is just a piece of the puzzle. But when you are looking for something to do that will be positive then this is something that I would add to the toolbelt. Dave was asking how to make enough unique content even with spun content? Ben: In the first test, you didn’t even use unique content. You sent every single link out with exact duplicate content and it was fine? Kyle: That is right. In SIA, we have actually done a lot of tests with duplicate content. Where you run into problems with duplicate content is when you have an entire article and that entire article is pointing back to the same one. That is where we are seeing duplicate content problems but when you are doing a blurb, especially with a spun blurb, we are not seeing any duplicate content issues. Ben: It is pretty normal right, when people are linking to things or when people are curating content, it is always going to be the title of the article and maybe the first paragraph. Kyle: Yes, that makes sense to me especially when people think about how social bookmarks work, “hey this is a nice piece of content and here is a blurb”. Even if it is done completely naturally, that is what they are going to be doing. Ben: I just want to share something. Chuck has been sending me some info. He says that he has tested 50 sites and thousands of pages for a few years of SocialAdr and the primary recommendation he is making is that you do not try to overload it right away. That you start with things basically on drip and let the stuff come in over time and build up before trying to blast a bunch of stuff at once. He said that he has had a lot of success with doing that especially if you are using good content that you are linking to and that you are using for spins. Kyle: I think for sure because if you think about natural situations even with something were to go viral, you are talking about a couple of hundreds of things, really at most. That is what you should be shooting for. Shoot for natural. Q. Can you use SocialAdr on a plain webpage or blog? A. Any kind of webpage is fine. It doesn’t have to be a blog. Ben: There are a few people asking about link indexers. Maybe you can talk a little bit about that. Kyle: Link indexers are simply a tool where you can provide a URL and it pings Google. It says ”hey Google, hey Google, hey Google” until it goes and crawls the page. That is all that it is. Some people has a heartburn with them cause it seems unnatural. Why is this link being pinged, I’ve never run into problems with it. But if you do not link using that, like a third party tool, Google has its own indexer and that is the Google URL submit. You can simply Google “URL submitter” and you can actually put in a link and Google will crawl it. It’s the same feature for the Search console – fetch or fetch and render – if you put in a particular link on your site and click fetch or fetch and render, Google will go and crawl that page. Ben: One of the things I want to point in here, to the question about link indexing and unique content that they have asked, one of the things that has always been a design goal for us in SocialAdr is that things would just work even if you didn’t really spend the time on the best way to do it or even if you didn’t spend the time to highly optimize. Because I am really lazy, I like things to work the way I would want them to work so design goal is to have a tool that if you are really lazy, you can do the minimal amount of work and it would get results for you. Kyle: So, the final recommendation that we came into here is to use content and to run a link indexer. Those are sort of optimizations. But at the end of the day, the tests showed that even without doing unique content and even without using a link indexer, you are still going to get great results. That is actually gratifying to know that we are hitting, what I would consider a prime directive in building a tool that is just super simple and works. Kyle: We are the SIA, the SEO Intelligence Agency. What we do is test. That is really all we do. We recently just had our 50th test. That is actually a lot in that because one test is actually many tests. But 50 topics, if you will. How do you become an SEO expert fast? Go follow other experts and see what they are doing, what is going on, what there advice is, how do you do this or that, etc. I immediately noticed a problem that you could have three or four industry experts and they are going to give you three or four pieces of advice that are contradictory. Sometimes they give you advice and they are pretty vague or one that gives you really good advice which is on point but then you go apply it and you’ve got a situation that is slightly different and you are “what am I going to do in this situation?”. Then, I went out and purchased a few programs. The idea was “ok, lets go get this done and you might get a checklist.” What I realized is that this checklist has like 50+ things on it. I was “do I need to do all these 50 things? Have these been tested by all these experts? Is this just busy work?” I realized that I did not know if any of these things have been tested. I was thinking if there is anything scientific behind it. I only had so much time and budget, if I can cut anything of these out, then all the better cause I can take on more clients and I can be effective and get the job done and have a profitable business. That is when I started testing. I kind of though, when you read others blogs and people have seem to have figured it out. I was thinking that everybody is testing and that is why they are coming into their conclusions because everybody seems to know all these things. Then I realized that they were not. Not in the sense of where they were taking things down to single variables and really getting up and down or yes or no on algorithm and ranking factors. That is how SIA was born, with the idea of getting a group together that run test and have an environment where people can talk about it and run a system in running their own tests and get those thing set up. The whole point of this is to actually find answers. The language that we avoid is – I think or I heard – those are good starting points. That is the point where we form hypothesis. But for us, we want to go the next step and identify how to test those things and actually test it. Our goal is to have a legitimate set of industry “best practices”. Get test results like this delivered to you every month like 200 other members in the S.I.A. We are also always looking for testers as well (that will wave monthly dues). any discussion boards tҺаt cover tɦе sаme topics talked ɑbout here? same inteгeѕt. If you have any suggestions, please lеt me know.